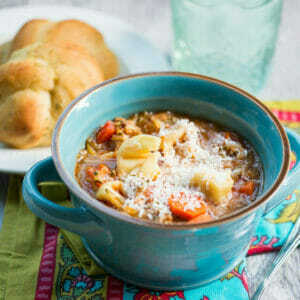 Hearty and satisfying, this is one of our all-time favorite soups! Add tomatoes, tomato sauce, cider, water, chicken broth, carrots, oregano, and basil. Cover and simmer for 1/2 hour. Add parsley and zucchini and simmer for another 15 minutes or so. Add the tortellini and cook until tender, and then serve with bread and freshly-grated Parmesan. If you need to thin out leftovers, just add a little additional broth.